The timing is spot-on and the market environment is absolutely perfect for the press release that flashed across my computer screen today. It’s a fusion of two companies – one world-famous and the other a red-hot up-and-comer – that’s going to take the health and wellness industry by storm. Wealth Research Group has consistently picked out the most profitable companies on the market, and when a big news item comes out, it’s my duty to report it to you first so that you can take prompt action. This is one of those times when I just couldn’t afford to wait – I had to get this update out to you immediately. It’s huge news and it’s hot off the presses: in a significant milestone for the global health and wellness market, it has just been announced that nootropics-infused functional beverage and supplement company Koios Beverage Corp. (CSE: KBEV; OTC: KBEVF) has signed a vendor agreement with nutritional product giant GNC Holdings, Inc.
Canada, in addition to their online store which receives millions of visitors. 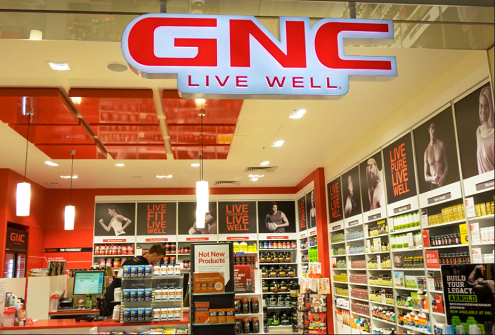 Across North America, GNC is widely recognized as a leading global wellness superstore where people love to shop for nutritional products like supplements and health drinks. 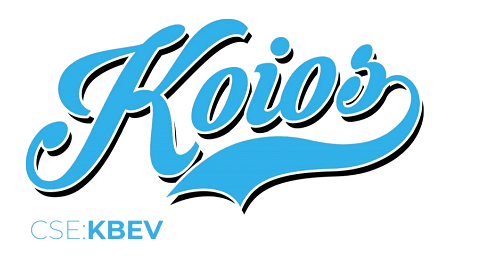 Koios Beverage Corp. already has a large and growing distribution network of retail locations throughout the United States; you may have seen their products at 7-11, Conoco, or Gold’s Gym, or online through their website, MentalTitan.com, or through Amazon. Teaming up with GNC, however, will take Koios’ network to a whole new level. Everywhere they’re sold, Koios’ products have been extremely popular with today’s mindful and health-conscious beverage and supplement consumers. Using a proprietary blend of nootropics and natural organic compounds to enhance human productivity without using harmful chemicals or stimulants, these products are known to enhance focus, concentration, and mental clarity. Also called smart drugs or cognitive enhancers, nootropics are supplements or other substances that improve cognitive function, particularly executive functions, memory, creativity, and/or motivation in healthy individuals. 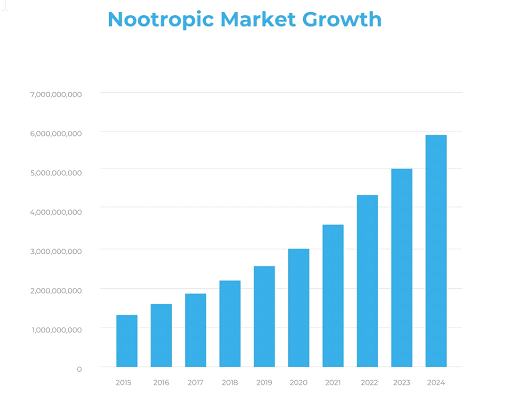 The global nootropics market is growing at a rapid pace and is expected to exceed $6 billion by 2024, expanding at a CAGR of 17.9% from 2016 to 2024. Partnering with Koios makes perfect sense for GNC, as it’s a means for the company to get into the nootropics and functional beverage markets. And for Koios, teaming up with GNC translates to potential access to over 6,400 high-traffic retail locations throughout the United States and Canada. Koios’ CEO further added that the company is “incredibly confident we can deliver the best products in their category and look forward to tremendous growth opportunities with our new partner in the years to come.” Wealth Research Group also looks forward to watching Koios grow with GNC as the nutritious beverage market makes strides into a new and exciting year for investors. Never base any decision off of our emails. stock profiles are intended to be stock ideas, NOT recommendations. The ideas we present are high risk and you can lose your entire investment, we are not stock pickers, market timers, investment advisers, and you should not base any investment decision off our website, emails, videos, or anything we publish. Please do your own research before investing. It is crucial that you at least look at current SEC filings and read the latest press releases. Information contained in this profile was extracted from current documents filed with the SEC, the company web site and other publicly available sources deemed reliable. Never base any investment decision from information contained in our website or emails or any or our publications. Our report is not intended to be, nor should it be construed as an offer to buy or sell, or a solicitation of an offer to buy or sell securities, or as a recommendation to purchase anything. This publication may provide the addresses or contain hyperlinks to websites; we disclaim any responsibility for the content of any such other websites. We have entered into an agreement for three hundred thousand dollars and five hundred thousand options paid for directly by the company. We have also purchased shares and are long the company. Please use our site as a place to get ideas. Enjoy our videos and news analysis, but never make an investment decision off of anything we say. Debt Wall: Gold and Cryptocurrency LIFELINE!